FunnelFlux is unlike other trackers in that the "flow" of users happens from node to node with no limits on the path they may take. This is a very simple flow which can be described with visits, clicks, and eventual conversions (at least you hope so). However, with FunnelFlux, visitors can enter anywhere, since you can generate a link for any node in the funnel, they can travel to and from any node based on your design, as well as navigate from lander to lander, offer to offer, and anything in between - rather than being forced to go from lander > offer and end their journey. Thus, we need to have slightly different stats to describe user behaviour. This is why we have lander views, lander clicks, offer view, offer clicks, node views, and uniques for each of these. Here, I'll explain how entrances and node views work, as well as how we define uniqueness of a visitor. An entrance is quite simply a user entering your funnel, either via a tracking link that redirects them, or loading a page that has the FunnelFlux no-redirect JS on it. When a user navigates between nodes in your funnel - by action links - no new entrances are generated. Then in these cases a new but non-unique entrance would be generated. It's a new entrance as they navigated to a node indirectly, not via the intended action links that connect nodes together or with a previous node as the referring page. It is non-unique because FunnelFlux is already aware of the user and has tracked/cookied them already. They would also retain the same visitor ID. So, for the most part you will see your entrances count being significantly higher than your unique entrances count, because of the number of people who return to pages either organically or by clicking ads multiple times that go to the same funnel. Node views count the number of "hits" a node has received. A node being anything in your funnel - from the default traffic node, to rotators, to conditions and landers/offers. Everything is a node! 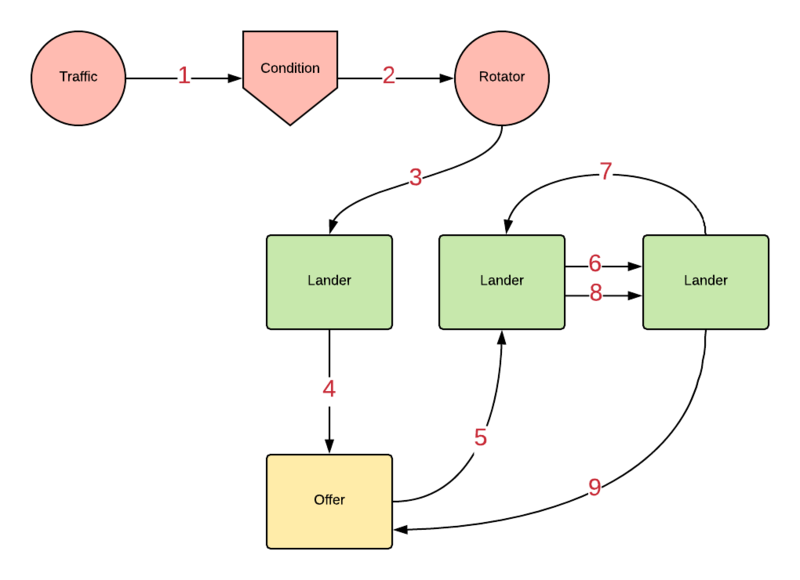 All views extend from this - so lander and offer views are both just node views where node type = lander or offer. The amount of node views you see will depend on your funnel and how many nodes users are passing through in their journey. In this case, they enter at the traffic node, head through a condition that sends them to a rotator, and then a lander. This flow results in 4 node hits, all of which are unique, and one of these is a unique lander view. It's important to note that node views happen inside of a particular entrance. So whether a visitor has a unique or non-unique entrance, all their node views are independently tracked and recorded within that entrance. For this reason, a returning visitor who creates a new, non-unique entrance, and travels through the same nodes as before, would still generate unique node visits. In this sense you can imagine a funnel entrance is like a customer walking into a restaurant, and node views are the dishes they eat. Every time they walk through the door, whether they are a new or returning customer, it is a separate entrance. Even if they go away for 2 hours and come back, its still another entrance. Then, the dishes they eat while there are all unique node views that are part of that customer's entrance, regardless of if they had those dishes the previous time they were there. Because of this, you will generally find your unique and non-unique node view counts are quite close to each other, as separate user visits do not create non-unqiue views. So when do we see non-unique node views? These happen when a user can navigate to nodes they have already visited while still in the same entrance session. The easiest example of this is when you have action links that let people navigate forward and backward between pages/nodes, e.g. if you have a series of landers and on each you let people link to previous ones they visited. In this scenario the user would not be making a new entrance but would be revisiting a node that they have already seen, thus giving a non-unique node view. Here, users get sent to a lander and then offer. Let's assume on the offer page you then give them links to other landers where you push the sale further - e.g. if they are not convinced, you tell them to look at your testimonials, a live demo page, etc. and each of these landers link to each other + back to the offer. This is quite normal, as a typical website selling something would let you navigate to other areas to learn more, not trap you on an offer page in complete isolation. Here's where things change. They click an action link that takes them back to the previous lander. This creates a lander click, followed by a non-unique node view that is also a non-unique lander view. The user clicks an action link again. This click has happened before in this user's session so it is a non-unique lander click. They hit the next lander, generating a non-unique node view that is also a non-unique lander view. They click an action link that goes to the offer again. This is a unique lander click since it has not happened before, and it goes to the offer that has been visited already, so it generates a non-unique node view and non-unique offer view. In the above scenario, if the user was to reload the tracking link that sent them to the entrance node, they would start a new entrance. It would be non-unqiue, but all the node views would follow the same pattern as above. Lander and offer clicks come from users clicking the action links on these nodes. Each time these are loaded a lander or offer click is generated. It will be unique if the user has not clicked that action link on that node before, within their current entrance. So much like with node views, if you loaded a tracking link > redirected to a lander and clicked through, then reloaded the tracking link and did it a gain, it would generate two separate and unique landing page clicks. These clicks are also counted as unique if they have different action numbers. So, if you have a page with 4 action links on it and a user opens all of them in new tabs, they would all be unique landing page clicks as they are in fact different actions. It is these lander/offer clickthrough actions that are used to calculate CTR, and these action links should be used to correctly connect nodes to each other. ...then this would trigger a new entrance and would not log a "click" event. This is a common mistake that will disrupt your tracking - importantly, tracking field information that your user brings from a traffic source is associated with their funnel entrance. So, if you break the entrance in this way, the user may lose their custom field data, making it difficult to attribute downstream conversions to traffic source data. We are currently working on ways to minimise this entrance-related data loss when using non-ideal tracking configurations.